I knew that Brian Benchoff was working on a badge in his spare time. I had no idea the production he had undertaken. 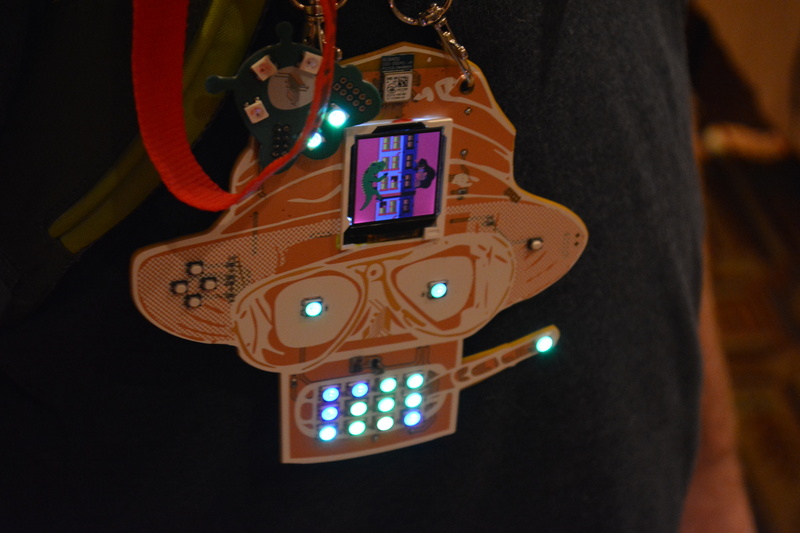 Brian’s Mr Robot Badge was one of the most popular of DC25. He had been working on it for months, ordering several PCB test runs to get the look just right. That’s not a custom solder mask color for the skin tone. Brian used a clear solder mask and two layers of silkscreen when he had Seeed Studio produce the PCBs. It’s driven by an ESP8266 and includes a 144 LED matrix driven by an IS31FL3731. Check out @MrRobotBadge to see the drumbeat of social media he built leading up to the con, and hear the entire story in Brian’s words on his recent project page update. Our friend [Krux] is the mastermind behind the badge design. As you can see, it is laid out to resemble a rotary phone. Each of the numbers on the dial is a capacitive touch sensor, and the numerals/letters are open spots in the copper. These let back-mounted LEDs shine through. The badge comes as a kit so to use it you first must solder on those surface-mount LED as well as a connector for the screen and the LiPo on the back. [Brian Benchoff] actually built three badges for DEF CON. The second was terrible, but the third was a solder kit of Ohm, the Tindie dog. [Jasmine Brackett] and [Shulie Tornel] were on hand talking to people about Tindie (a great place to sell extra hardware badges) and handing out the solder kit that includes two self-blinking LEDs, coin cell and holder, and a custom PCB. [Sean McCabe] had a 3D badge. It’s the DEF CON 25 logo (note the 2 and 5 make up a skull with keys as the crossbones). There’s an RGB LED controlled by an ATtiny85 and coin-cell on a custom PCB. Grab the design files on his repo. There was also a ‘punt’ badge. The SecKC folks built a badge (shown later in this article) but couldn’t produce enough in time so they showed up with edge-lit acrylic badges. The DC Zia crew had about 10 people working on the badge this year. It’s their third year building badges for DEF CON and this one features four Cherry MX mechanical keyboard switches… clicky! The badge is a shield for an Arduino 101 (RIP). Last year they built a badge that was a shield for a Raspberry Pi and had a full-color video screen which they were showing off at the meetup. They are also joining in another trend, several badge groups (including MrRobotBadge) were giving away custom fidget spinners as swag. I’m not going to go too far into the AND!XOR badge since I did a full hands-on with the badge before the con. Here we can see the “God” badge that only the core team had. The Bender on a Bender was top three most popular badges at the con if not the most popular. They had a hugely successful Kickstarter and everyone was trying to get one at the con. They shipped with the multiplayer features disabled until a code was input. This was Tweeted out at the beginning of the con and once people unlocked theirs the botnet game began. I was able to terminal into it and escalate my privileges to get root ([@Hyr0n] did help me out by suggesting which of his hint Tweets to revisit). I came across [Samy Kamkar] with on in the Chill Room. The code running on the ARM processor was read protect and [Samy] was using a Chip Whisperer to try to side-channel attack the badge. That’s pretty awesome! Note the brain-slug addon board. There were about 10 of these built to test out the breakout header for hardware hacking. Badgelife is often pushing right up against deadlines to get everything finished — this is an extracurricular activity after all. This is the un-populated Car Hacking Village badge. The assembly took longer than expected and the finished boards hadn’t arrived as of Thursday evening but did make it for sales in the village on Friday. 900 of these were for sale at $50. You can see the full glory in this animated Tweet. An OLED display makes up the grill of the truck (which is a PCB itself) with amber blinkies all around. This is car hacking after all so the footprint on the left is for an ODB-II connector. The Tribble badge was a total surprise for me. [@emilyincarnate] built 58 of them and they were all hand-sewn and hand-soldered. The little balls of fluff were built around Adafruit Trinket boards, with addressable LED discs for eyes. I’m a sucker for the PCB badges with challenge games built into them, but I fell in love with this and it was my favorite to wear around the con. Perhaps I’m anthropomorphizing? I checked out the associated website and it seems there are some crypto challenges waiting to be solved over there. Get to work. Look on the back of the DC801 Sheep badge and you’ll spot the familiar Rigado module that drives it and links it to the unified botnet game spanning many of the badges and Bluetooth greetings that talk back and forth. In addition, the firmware broadcasts username and then play a game of contagion. [@rushan_ee] has been developing the board. The prototype boards carried by the core developers have “God” mode that can make clients go in and out of party mode. In total, they built 290 boards plus the 10 prototypes. Presales were coordinated through 801labs hackerspace in Salt Lake City. This is the second year Rushan has led the design and 5 years total for the hackerspace. The Octopus badge was built for Bsides Vancouver a few months back. [Jake King] made a total of 120 for Bsides Vancouver. It is driven by an ATtiny85 with blue LEDs on four of the eight tentacles. There are two WS2812 modules for the eyes but [Jake] usually leaves them off because they drain the coin cell battery really quickly. You can get your hands on the design files on his blog. I think the Ides of DEF CON badge was one of the other top three most popular badges. It was inherently a multiplayer badge, letting you discover and battle other badge owners wirelessly in a video role-playing game. You could walk around the con and see people sitting around glued to these badges like a Game Boy. Thursday night was the first night everyone was getting together and when we ran into [Zapp] from the AND!XOR crew he was already topped out in level, and XP. The firmware wasn’t read protected (like the AND!XOR firmware) and so [Zapp] dump and disassembled it to artificially boost his player ranking. It’s an instant classic. You can read about the dev process on the Ides of DEF CON project page. They had a very successful Kickstarter earlier in the summer. This badge was introduced to me as the only badge with a Vacuum Fluorescent Display on it. The VFD is an HD44780 addressable character display. Powering it is a 18650 cell in a battery holder. This is becoming an incredibly popular setup for badges and other custom hardware. You can check out the design, which is based around an ATmega382, on the Team Bazooka repo. This is an ultra-rare badge — so far there’s only one. 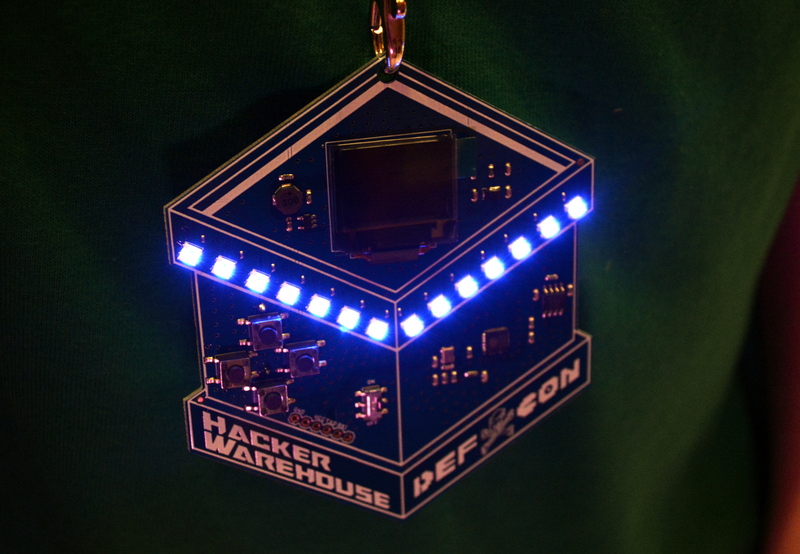 We also took a close look at the Hacker Warehouse badge before the con. It has an ESP8266 laid out right on the board rather than opting to solder on a castellated module. The badge is a built as a WiFi testing unit, leveraging the ESP chip’s flexibility in that realm to scan for AP, listen to packets, and even spew deauth packets. I don’t think there was too much mayhem cause on that front this year. One of the really cool things that went along with the Hacker Warehouse badge is that they shared their space in the vendor area with other Badgelife folks. This provided an area for people who had acquired any of the badges shown off in this article a place and time to meet up with the badge creators themselves. Neat! It’s worth noting that this was the first hardware endeavor for Hacker Warehouse which has focused on offensive security up to this point. The DC503 throws503.party. Thank you to [Joe Fitz] for letting us crash it. The party is privately financed and supporting these badges is one way to get yourself into the party. [Joe] is behind this badge, as well as the bicycle design we saw at DC23. One hundred of these badges were made through the effort of four team members and with the labor-saver of professional assembly. You can see the Rigado familiar rigado module on the back, and the coin cell that powers the badge. I really enjoyed seeing the lanyard, which is a USB-to-Serial cable. You are literally wear what you need to hack it around your neck. The badge hacking contest was judged in the suite at Caesar’s during the 503 party. SecKC is the Kansas City infosec meetup. 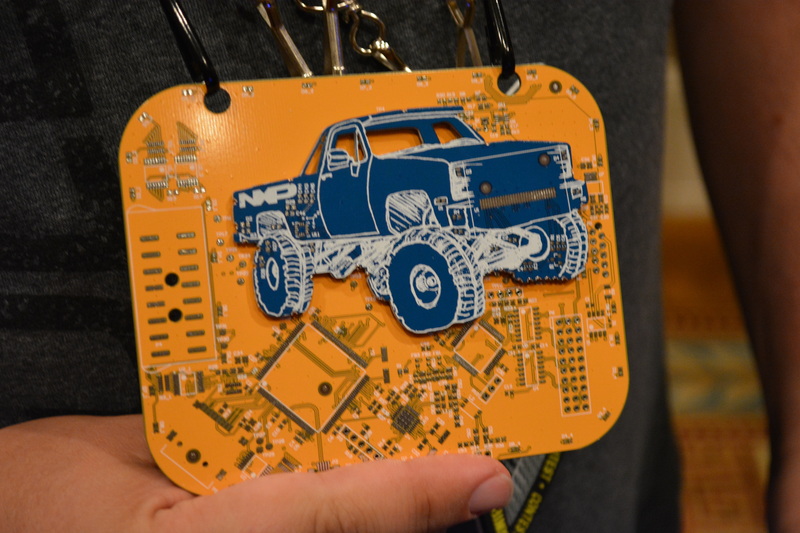 They wanted the badge to be a devboard and based it around an NRF module from Sparkfun. So far they’ve seen numerous hacks on the design, the best of which turned it into a cellphone with a rotary dial. The crew had a preorder of 50 boards and ended up building 60. There was demand for more but they couldn’t get the boards fast enough so they made the acrylic badges we mentioned earlier in this article. The puffy badge is another that we had an in-depth look at before the con. Shaped like a puffer fish, the badge is based on a router chipset module that was sourced from “some dude in China”. Searching for router chips that could run linux, 40 of the modules were ordered for the project. More details about the development process are available on the website. Some people feel like they need to answer the question “How bright can a conference badge really be?”. [Blenster] answered this with a huge triangle badge powered by six 18650 Lithium cells. Look at the power regulation on the back of that thing! Not to be outdone (by himself), [Blenster] was also sporting a DerbyCon 2016 Black badge which he designed and built himself. Those LEDs have a tiny pitch and he hand-placed and hand soldered with an iron — incredible. 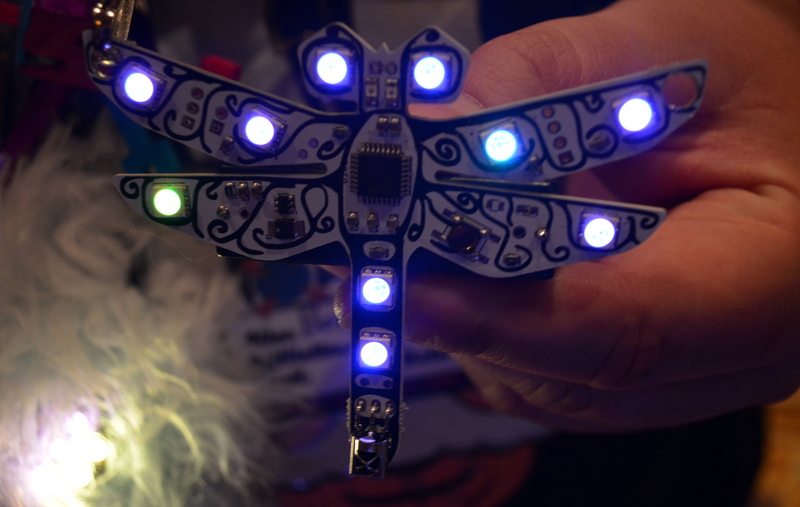 The Dragonfly Badge was featured on Hackaday before the con. It’s primarily a blinky badge, but put more than one of them within sight of each other and they’ll sync up their flashing. One of the really nice touches is the aesthetic of the IR receiver on the tail. 106 of these were built but only 85 were fully functional on Thursday night. In true hacker fashion, the rest were being reworked in the hotel room. I saw a ton of these around the con so I suspect the rework effort was worth it! The Crypto and Privacy Village badge was one of the most gorgeous pieces of hardware on hand. The team went all out, even delivering the badge in beautiful matte black boxes with guilded lettering and a magnetic closure. The lanyardware have a cypher on them, the back of the badge has a cypher on it. There were PCB keys, ornately cut in interesting shapes. The badge is based on the WROOM32 (ESP32) moduel. It drives a backlit display with a rotary encoder on the front and a few capacitive touch sensors. The package included earbuds; the badge has a headphone jack and was set up to stream DEF CON radio all weekend. That’s a feature of a different color and quite fun! Plugging into the badge you were greeted with MicroPython for you own badge hacking. On the wireless side, it finds other badges. I couldn’t get confirmation for sure but I heard that these were putting backdoors into the Bender on a Bender badge. Yes, it’s wireless badge warfare out there, friends. These boards were selling for $120 in the Crypto Village. When they sold out the team was trying to get the nonfunctional badges working but would sell to enterprising hardware hackers for $50 upon request. [bon] and [redacted], the team behind the Bsides SF badge, came out with two badges this year. Their ‘official’ badge is being pitched as a ‘body camera badge’ for their conference in February. Their second badge is quite literally the best 3D printing work we’ve ever seen. The Life’s A Breach / Tiki badge is more or less what you would expect from a conference badge — there are blinky bits, batteries, and some nice silkscreen art on a PCB. This gets dialed up to twelve when the 3D printed parts are added. The plastic parts on the Tiki badge are snap fit, with plastic bosses for holes on the badge, tiny ledges to clasp the PCB firmly, and a bit of vellum used as a diffusor for the eyes. We’ve been around the block with 3D printing, and we’ve never seen anything that marries milled PCBs and printed parts this well. We’re literally begging the Tiki crew for a write-up on how they managed to do their plastic parts. The 1Bitsy 1UP badge should be an incredibly familiar form factor. It’s shaped just like a Game Boy, but with an extra set of right-hand buttons like on the old SNES controllers. With a beautiful color display and audio, this is the portable gaming experience you remember, but hanging around your neck as a conference badge. I missed syncing up with him at the meetup but later ran into [Red] in the Chill Room. He has been doing the hardware badges for SkyDogCon and built a special badge just for DC25. It is sniffing LoRa packets and displaying them on two screens. He wrote the firmware on the plane. The platform is meant for development so plenty of room to grow here. It has a multitude of switches, both momentary press and DIP, which are controlled by the Propeller chip that runs the board. For connectivity there is the LoRa module and an ESP8266. There’s actually a really cool concept at work here. He sets up a server in his room in a different hotel as the Internet gateway. The badge phones home on LoRa, which has great range, eliminating the need to navigate the shady WiFi options during the con. This badge is a lot of things in one. Primarily it’s a quadcopter complete with a badge-based remote control. [Brian] covered it in depth before the con and we were so excited to receive this badge kit at our Breakfast at DEF CON meetup. Weight was carefully considered during the development process. But for some reason the thing just wouldn’t get off the ground after everything was assembled. For this reason, there are two versions of the skull badge, one that flies and one that bling. You can see the add-on board for prototyping which is mean to look like a pirate’s bandanna, and in the upper left you can see the dual-stick controller complete with a buzzer and screen. Badgelife is truly amazing. Should you give it a try? Yes, but not for the money. This is an art and not a business endeavor. There is no badge competition between makers, there is only a willingness to celebrate the effort and ingenuity to that go into every badge, whether it be a blinking LED or a networked multiplayer game. This is what drives the developers and what makes the badges themselves such a hot commodity at the conference. This was the greatest year of badgelife yet, and we can’t wait to see what everyone will come up with by next year. I prophesy that most of the various badges there will fit together into one huge “MegaZord” style badge, sharing processor power, LEDs, displays, batteries, RF capabilities. Then, the following DEF CON participants will be able to assemble their badges into the Ultimus Prime or Decepticon versions and “battle” each other. There will be a dedicated conference: Badgecon. WTF? Forgot the best badge of all, the quadcopter! D’oh. I covered it in the Hackaday meetup roundup and must have scratched that itch when I put it together. I’ll add it in now. Thanks! One of the more rare badges! In your badge shot at the top, there is a a rectangular badge on the Left, edge of the table. That is the DC208 badge (I know, I helped build it). The badge had flashy light patterns and a UV sensor mode that would engage a speaker to make Geiger clicking sounds and flash the lights accordingly depending on the level of UV light. These are great! I especially like the old rotary phone ( still have one in storage)! Are you selling them on line? It’d be worth hitting this article with an editor and spellchecker – some really interesting gear is mentioned but the wide ranging spelling mistakes and jumbled sentences really do detract. I was wearing my rotary Linemans Handset around the con this year. It took me till Saturday night to get this years Darknet badge. Might as well call it BadgeCon since they get more page space here than anything else happening there. Why shouldn’t they get the most coverage? 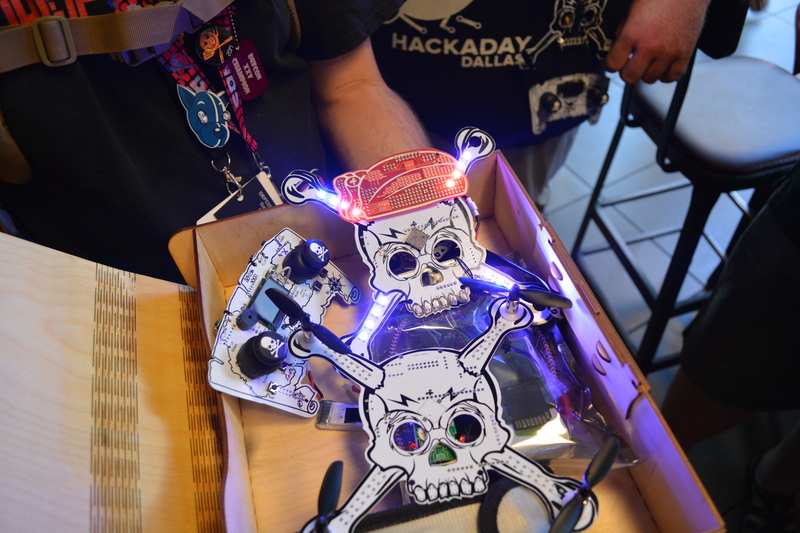 HAD is primarily a hardware hacking site and many of the badges featured were logged on hackaday.io. It’s easily the most relevant part of Defcon to this site. Where do these people get the money to spend on badges like this? I was wondering that. Then I realized I don’t care. Compare it to more traditional collectors–action figures, comic books, animation cells, movie props, etc–and I don’t think it’s surprising at all, especially since there really aren’t that many items to collect by comparison. My theory is that many of them are at the con at the behest of their employer and because of that they easily have $100+ burning a hole in their pockets. It is more productive than gambling, right? I’ll make a point to ask people next year. I am always surprised to see how many Defcon attendees, that should know the odds of gambling, were still at the tables or slot machines. I would much rather spend my money on some pretty flashy and well put together breakout boards with some really cool hardware attached.